Well, the news months ago said that the Catholic hierarchy, i.e.Catholic Bishops' Conference of the Philippines (CBCP), voted not to demand the resignation of the "devout Catholic" Gloria Macapagal-Arroyo - never mind her hypocrisy. No surprise. A few days ago, the CBCP released its updated guidance or pastoral letter. Now suggesting further pursuit for the truth regarding the Y2004 elections, the CBCP obviously still does not want any direct involvement as in the past (EDSAs). I think and believe that any new EDSA blessed with CBCP support does not guarantee any radical change, as has happened in the past EDSA1/EDSA 2. We should now realize that a simple change in the personnel in government has not and will not work for the long-term betterment of the impoverished majority. The predominantly conservative bishops (I guesstimate that no more than 10 of about 86 bishops in the homeland may be considered progressive, i.e. really care and act for the common good) to keep the kolehiyala Gloria rather than encourage oppositionists of all colors to go into a free-for-all among themselves: the Fidel Ramos-military, former Marcos cronies, Estrada followers, born-again Brother Eddie devotees, etc. Had the CBCP last year called for Gloria to step down, the girl could have been down and out, as before her, through a repeat of an EDSA or other ways, given that Catholic Filipinos, here and abroad, are mostly a herd of sheeps. Even in the face of a decades-old and worsening national predicament in the homeland, we should remember that the CBCP and majority of Catholic followers do not want any radical change in our society. They seem to believe or be mislead that prayers will lead to miracles. The Spanish friars of yesteryears have been replaced not by a native hierarchy and clergymen of the heroic GomBurZa variety, but by native versions of the Spanish friars and American missionaries, most of whom were reactionaries, content with their comfortable lives under the status quo while perpetually teaching the believing faithful to practice escapist piety, to forget their dire predicament and suffering, and to look forward to a heavenly afterlife. I believe and think that this is one big reason why our homeland is in a very deep hole and getting deeper. Historically, the Christian Church (Catholic or Protestant), where it is or has been the majority, becomes a defender of the status quo. The revolutionary Christ who was crucified by the Romans for being a "de-stabilizer" has been sold out by his so-called modern disciples. Actually, this devolution into a reactionary and conservative stance is characteristically true of all religions that started as a minority movement, revolutionary cult or sect. Our mainly native Catholics, most especially the so-called educated and the socioeconomic elite -- have either ignored or not learned from the ascendancy of their Church-anointed "religious/pious and prayerful" Cory Aquino, who grossly failed (we do not have to recount the results of her governance here). And of course today, the highly-educated, westernized and similarly publicly-religious but failed GMArroyo. We, the so-called educated, should know and do more. Specifically, we the so-called educated should acknowledge these realities and work with the impoverished majority instead of continually ostracizing, belittling and blaming them. We are the so-called educated and are therefore expected to have a better understanding and thus more empathy. We should act to re-educate ourselves and the majority about our nationalist history, about our learned Philippine-American history, long distorted by American colonialism and continued by our present leaders in business, government and our educational system. What are the present alternatives? When many of the major and well-known oppositionists to Arroyo are similarly incorrigible and unconscionable opportunists. When a number of them deserve instead to be put against the wall and shot, or put at least behind bars and the keys thrown into the China Sea. Different faces, same kind of people who have and would not hesitate to use their "gold, goons and guns" to have their way. They are probably church-going Catholics too; these practitioners of "split-level" Christianity. They label all who practice democratic dissent, including those who are Filipino nationalists and/or practicing authentic Christianity, as either "communists" or "terrorists" to rationalize their state-sponsored terrorism committed against dissenters. They do not get bothered, so calloused in heart and mind, by their thievery of government coffers, their corruption and cooptation with foreigners in business which in effect does violence to the young, the old and the sick, to the ordinary worker and their family: by depriving the majority of the native citizenry of food, medicine, and other essential human needs and services, such as proper education, health care, etc.. The present and past regimes by their cooptation with the World Trade Organization (WTO) that lead to the death of our native agriculture and industry, consequent loss of millions of jobs and the facilitated pillage, allowed by our mendicant government, of our national patrimony by foreign transnational and their local business partners. Now, we have had, for so long, economic deterioration, political deterioration, societal deterioration which are ingredients for a revolution. Is a bloody revolution and/or upheaval imminent in our homeland then? I venture to say NO although I am convinced that it is the only way for necessary radical changes, given the almost 60 years of pleadings by the impoverished people for peaceful changes (reforms) and promises by the political leaderships that never materialized. Any revolution now against the Arroyo regime or any governing substitute is untimely and irresponsible. A timely and responsible revolution has to have a good probability of success. Timely in the sense that a significant number, if not majority, of the native citizenry are primed for it; in the sense that a significant number, if not the majority, of native citizenry understands the reasons for it. Responsible in the sense that the human cost, i.e. lives to be lost or injured, will be selectively minimized and bring to fruition true and fundamental changes in the economic and political systems and social institutions; all for the "common good" of the native, Malay Filipinos in the homeland. It must be remembered that a bloody revolution is not a picnic; and a revolution by an irresponsible leadership with ignorant followers can lead to a simplified class conflict and random violence. Right now, I think and believe that a revolutionary situation is not completely present for a successful revolution, a nationalist revolution. A successful revolution in the sense that it will be nationalistic and united, that will remove from power the greedy and unconscionable among the ruling elite and their foreign partners. A successful nationalist revolution that will pursue the dismantling of the present political-economic system that allows the plunder of the national patrimony by foreigners and native partners. A successful nationalist revolution that will prioritize agriculture and industries to produce and satisfy first the essential needs of the majority and stop nonessential imports. A successful nationalist revolution that will mold a decolonized Filipino who preserves and nurtures the good in our own culture and multi-heritage and do away or roll back much of our inherited and excessive consumerism/materialism. A successful nationalist revolution to be led and supported by truly nationalistic Filipinos who sincerely identify with our revolutionary heroes who fought the foreigners (Spaniards, Americans and Japanese); and nationalistic Filipinos who continue to struggle towards those ends in the recent past and today. A successful nationalist revolution that will form a truly professionalized Armed Forces of the Philippines (AFP) subservient to the sovereignty of the people; and not to a foreign power, i.e. America, Japan or other, or a government that does not serve the common good of the unarmed, native citizenry/majority. To ensure such a successful nationalist revolution, first and foremost, mass education is sine qua non; mass education for a heigthened nationalist consciousness is imperative. Education to have the majority understand "what is going on". Education that makes the majority see the forest (the disease: present socioeconomic-political system) and not get lost in the trees (symptoms: all these current events/issues about military and civilian corruption, cheating, etc). Education to explain the neocolonial economic system that we inherited and adopted from the American interventionists/occupiers ("friends") which only kept in cage the majority of Filipinos to perpetual perdition. Education to instill knowledge and understanding that will propel them to demand radical and fundamental changes. Education that will ensure, produce and identify truly nationalistic leaderships and similarly nationalistic followers courageous and dedicated enough to fight for a more humane and dignified future for their children, grandchildren, and their unborn. It is only then that a successful nationalist revolution can be realized. 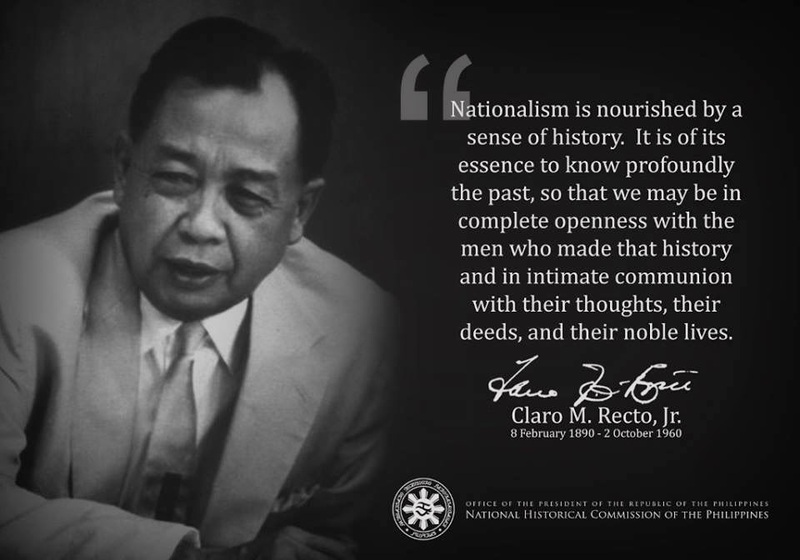 This educational process for fostering Filipino nationalism among the majority may take 10 years or a generation at best and will not be an easy task since the International Monetary Fund/World Bank/Asian Development Bank (IMF/WB/ADB) and WTO have imposed pressures on our national educational system to discourage study of our nationalist history. Thus the need for informal education via "teach-ins", conferences, etc. which was common during the premartial law/Marcos Dictatorship years(internet access is still limited to the middle and upperclass, per statistics, no more than an estimated 1-3 million Filipinos have access; and based on my surfing Pinoy sites, it seems safe to assume most are the young understandably playing games or engaging in teenage/young adult chat). With nationalism instilled among the majority who are then ready to sacrifice and struggle, the IMF/WB and other foreign financial institutions that built, in cooperation with our Americanized native technocrats, the millstone of odious foreign debts on our present and future generations have to go; and replaced with arrangements with other nations. The IMF/WB-imposed directions on our public educational system have to be dismantled. The decades-old promises of land reform, including the demolishing of agricultural land converted to golf courses, have to be firmly implemented together with agricultural education for the peasantry. The encouragement and protection of native agriculture and industry must be resurrected but with nationalist outlook and guarded against pure native and/or foreign greed. Of course, we should not forget who the US does and will support, since America has always thrown its weight around whenever political upheaval seems to blow up in our homeland. America's planners prepare and coolly act to place their bets on the surely, Americanized minds among native politicians, technocrats and military officers. In short, to identify and support Filipino leaders whose Americanized minds will continue to protect American economic and military interests in our homeland, instead of our own. An instance of support for Americanized minds: during one of the almost successful attempted coups against Cory Aquino by the RAM officers -mostly PMA Class 1971(attempted takeover to install the AFP as the new political/ruling elite), USAF jets flew over the rebel RAM soldiers. The RAM officers and their followers got the message and quit; that's how cowardly, unresolved and weak we Filipinos are (unresolved because of our shallow understanding or absence of nationalism); therefore always allowing a foreign power, our former colonial master and now neocolonial master, to call the shots. We should remember that America is vehemently against nationalism, i.e. Filipino nationalists, anyone who threatens its "national" interests, ever-enlarging beyond its borders, i.e. business or economic interests (or for that matter, any country's nationalists; as any serious and critical study of past and current world history will demonstrate, i.e. Iran, Cuba, Venezuela, Bolivia,etc.). America is not necessarily against communists, who it has learned to do great business despite its official proclamations for human rights, etc., as with the mainland "Communist" Chinese or Vietnamese. America's priority IS business, not human rights; we should be reminded. Let us also realize that nowadays America itself is now effectively and efficiently controlled by its transnational corporations, with its citizenry made content and quiet with conspicuous consumption, kept ignorant, distracted and misinformed of its unsavory historical relationships with underdeveloped countries such as ours, Iran, Iraq, Cuba in Latin America, etc. foreign affairs (which cumulatively lead to hatred for America --thus to the ignorant American citizens' surprise); and America has conveniently forgotten its revolutionary origins. Thanks for caring so much about the Philippines. I hope you will also sign this Petition to save the children in Philippine Prisons as exposed on CNN's World Report just this week. Mabuhay! Please provide active support to PREDA FOUNDATION, INC.(http://preda.org/)- Nobel Peace prize Nominee for 2001 & 2003, an Olongapo City-based NGO established in 1974 and dedicated to defending children's and women's human rights. I am glad you correctly diagnosed the grave mistakes of this People's Power government in instituting a program of free trade believing that it would be the answer to slow economic growth of our country. Free trade started on the assumption of power of Pres. Aquino and was continued by every administration under the People's Power government. Prior to the assumption of this People's Power government, the policy of the government starting from Quezon down to Marcos was to encourage the growth of local industries through reasonable tariff protection. The People's Power government has been trying to scare the people into believing that any alternative to their brand of democracy is reverting back to the Marcos dictatorship. That is why they are earnest is calling the regime they replaced as a dictatorship in contrast to their democracy. The truth is that there was never really any People's Power revolt. The opposition during the time of Marcos wanted to be given the same powers to revolutionize the government just as Marcos enjoyed. In order to give in to the opposition's demand for a revolutionary government, Marcos abdicated his office to give the People's Power government a free hand in organizing a revolutionary government to assuage their resentment that they were not given a chance to remake society the way they think it should be made. In place of martial law, the People's Power government instituted a policy of rigging the elections. That is why even though, in 1990, the Cory Administration registered a zero GNP growth rate, the administration was winning every election it installed its candidates. In fact, Cory succeeded in installing Fidel Ramos, her chosen successor, although he failed to get elected as the PDP-Laban's official standard bearer. No President in our country has ever won any reelection except Marcos and Quezon. GMA did not win the elections although she had 4 other strong rivals slugging the elections against her. In spite of the cheating, GMA won only a slim margin against FPJ. The public outcry against GMA's rigging the election shows that the people are tired of the People's Power dictatorship. Many businessmen were forced to close shop because the People's Power government insisted on free trade as the main economic strategy of upliftment our economy. The only way in which people who are dissatisfied with the performance of the government may express their grievances is through the elections, but since this People's Power dictatorship has denied them clean elections, they have been relegated to animals caught in a cage. They cannot do anything to express their dissatisfaction on the performance of the People's Power government. Now that GMA has promised a new constitution, we certainly hope that this new constitution will replaced finally the policy of rigging the elections that the People's Power government has instituted in place of martial law. The 1971 Constitutional Convention created a parliamentary system of government for our country. The failure of the parliamentary system of government in our country instituted by the 1971 Constitutional Convention was because the 1971 Constitution opted for a majority-type of elections. Usually, a parliamentary system of government is accompanied by a proportional type of elections and this is the practice of most modern parliamentary governments. A majority type of elections favors the status qou because politicians have to get the sympathy of the masses to get elected into office. In a proportion type of elections, politicians have a free hand to get the views of the intellectuals. The American government is organized under the majority type of elections. That is why, American politicians, like Filipino politicians, are not very ideologically inclined. Almost every thing that is said of Philippine politics is also true with American politics. The candidates are more influential than the political party. For a candidate to win, he has got to have the sympathy of the masses. In a proportional system of election, the political party has only to have a sizeable sympathy of the people, not necessarily the majority. It a political party could only obtain 15 % of the votes, it is entitled to 15 % representation. In a majority type of elections, you cannot win on 15 % of the votes. Right now, Congress has taken on itself to write the Constitution without relying on an incompetent Constitutional Convention to draft the Constitution. The House of Representatives favors the unicameral system of representation while the Senate favors the retention of the Senate. The compromise here is to adopt a bicameral Congress. The House of Representatives will be elected through a proportional system of voting while the Senate will be elected through a majority type of election. The resentment of the House of Representatives against Senators is that there are 10 members in the House against 1 Senator. In many bicameral system of representation, there are only 2 House members against 1 Senator. We could have 100 Senators and 200 Representatives in the House. The mixture of a majority type of elections in the Senate with a proportional type of elections in the House insures that the government will tilt to conservatism. The Senator who are elected through a majority type of elections will have to be very sensitive to the concerns of the masses while the House Representatives will be sensitive to the concern of the intellectuals. I hope that Congress would institute a bicameral parliamentary system with a mixed majority type and proportional type of elections to do away with the policy of election rigging that has been instituted by the People's Power government in place of martial law. People who are dissatisfied with the performance of the government can now express their dissatisfaction by casting their ballots in the election. One of the major reasons for the continued unpopularity of this People's Power government is because since they are no longer accountable to the people during the elections, they have ignored the people's sensibilities in making of the laws and policies of the government. Cory Aquino had no concern whether brownouts during her administration was causing immense suffering on our people since she could just rig the elections as she pleased. Congress has also passed this anti-smoking ban throughout the whole Philippines. Prior to the People's Power government, no administration would pass such laws knowing that it meant sure defeat in the elections. By the way, Bert, I am seriously proposing that you gather all your articles and publish it in a book. The Filipino people needs your expertise in political matters so I hope you won't disappoint them. Thank you for your response and encouraging remarks. Yes, free trade is disastrous for us, for weak and poor countries like ours can not compete. The strong will always destroy the weak. It's plain common sense. The disastrous results stare at us. Our past and present leaderhips/technocrats have been taking us to what we may call "absolute free trade" (on our part); and away from the "mixed economy" --however inefficient but providing more jobs, less poverty-- that our country has been practicing; until the Marcos regime immersed itself into much foreign debt thus making itself (our government) amenable to the IMF/WB-imposed economic conditions/programs of economic liberalization which are always attached to the extended loans. Through the years, these programs have further morphed into the so-called WTO-agreements (more conditions of neoliberalism/globalization) the leadership signed on in 1995 (Ramos and Arroyo led), ergo the ever-worsening socioeconomic predicament for the majority. All these despite the fact that the rich nations (G7) do not themselves follow the WTO agreements because they still practice protectionism. The rich countries demand free trade from the poor countries such as ours, they set the WTO rules to which our mendicant leaderships have no balls to disagree and say no. I get the impression you have a somewhat different understanding about the developments in our political economy, the Marcos years, etc. Anyway, the current talks on the proposed Charter change, involving suggestions as to form of government, electoral reforms, etc. and much more serious --in my view--of the less discussed further selling out our national economy/sovereignty should be rejected. Regardless of the form of government, our political climate calls for a socially transformed leadership and citizenry who will be truly and actively committed to serve the common good. Lest I be repetitious, suffice for me to say that I have touched on these matters in my previous blogs (several others also did). As to how we can become or obtain the socially transformed people is the big question. Our present society with its institutions does not offer a milieu that encourages the formation and/or nurturing of individuals with a social conscience; even our churches and the clergy --our last hope-- have failed. It seems only a cultural revolution together with a bloody revolution (hopefully not a Polpot or French-type revolution) may be the only recourse, though having a revolution is no guarantee for the better, as it only offers an opportunity for radical and fundamental changes. The direction of such a revolution will be dependent on the degree of social awareness of a significant number of the populace or of the majority. In the end and for now, we just have to continue the discussion which hopefully will reach the majority, since without them learning and understanding "what is going on," it will be easily subject to manipulation by power-hungry natives and/or foreigners and no fundamental, long-term changes for the common good will occur; as has been happening then and now. Frankly, we may not expect or see such a change in the present generation. Let us remember that the pursuit of change does not happen in a vacuum. There are internal (native)and external (foreign) forces which actively work against it, against the masses getting to understand "what is going on."